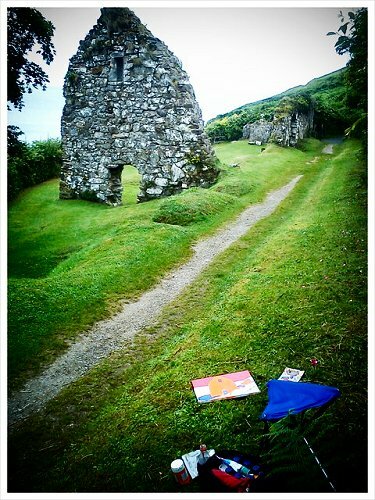 In the summer of 2011 I embarked on a cycling painting social media trip of Ireland. Cycle Ireland’s 32 historic counties, finding people to stay with through twitter, and doing a painting on site for them in return for being fed and sheltered. If on any night I was unable to find a host through twitter I would paint and try to sell that painting via twitter to fund a B&B or hotel. To fund supplies for the trip I would agree to paint 10 commissions at any location on the island which, together with the location of the people who volunteered to host me, would determine the route of the tour. The tour started on July 1 from my studio in west Dublin, and finished after 3,000 km of cycling back in Dublin on September 23. Having previously done solo long-distance cycles across both America and Europe, this cycle was shorter but far more intense because of the painting and the social aspects. Dozens of paintings were completed, hundreds of tweets were posted, something like 4,000 photographs were taken (of which I haven’t shown you 90%), there was a sketchbook, a series of audio recordings, and lots of blog posts, as well as some national media attention. A couple of dozen more paintings were started and then finished back in Dublin (A small number are still being completed but shouldn’t be much longer). Work on the site will continue to populate it with words and images of the trip, but more effort is currently going into a book I’m writing on the trip. I’ll let you know what’s happening with that when I know what’s happening with that. A lot of audio was planned, but when 5 of the first 6 pieces I recorded evaporated into thin cyber air with me standing at the side of an Irish road trying to upload for ages, I lost heart. And other times I went to record, often just sounds, only to find android wouldn’t cooperate or that I’d forgotten to bring a microphone. But mostly I just clean forgot. 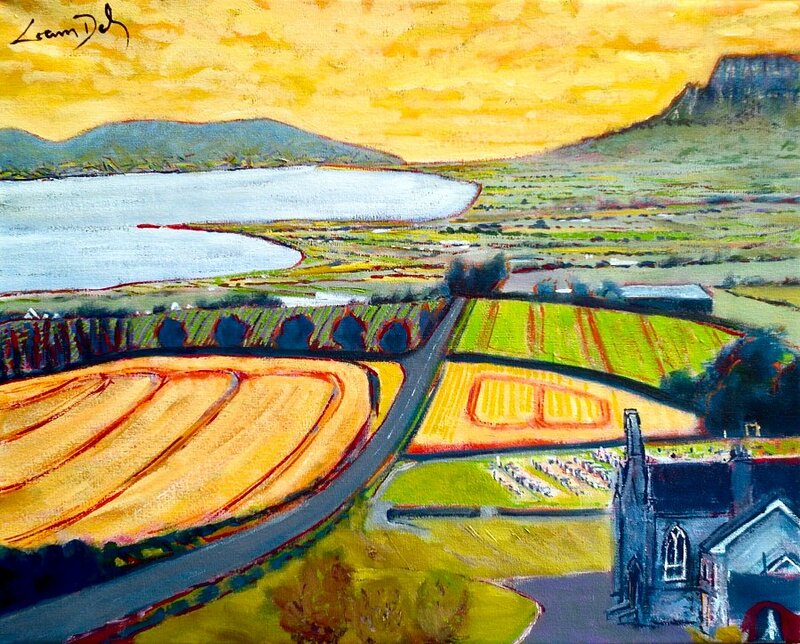 Loch Con Aortha is a painting done mostly on site on the Painting Tour when in Connemara, and finished back in the studio in Dublin. I cycled the coast road from Galway out past Spiddle and Ross A Mhil, on the R340 to beyond the Rosmuc peninsula and there, a few kilometres before Cill Chiaráin, nestled under the Cnoc Mordáin ridge, is the small lake that is Lough Aconeera. This painting is one of the 10 original commissions to fund the Painting Tour – specifically to buy the tablet and and the dry bags. Sitting in Connemara painting was an utter joy and the beginning of my most extraordinary day ever on a bicycle. The rest of the completed paintings from the trip can be seen here. 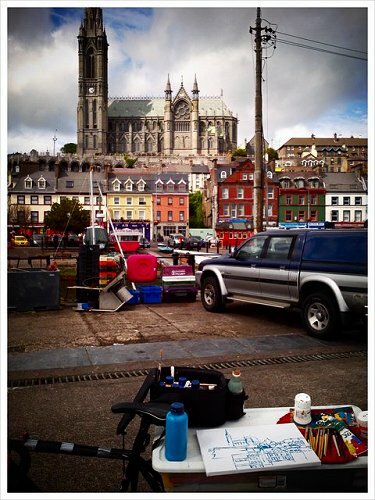 Other paintings mostly done on location on the tour itself and completed since back in Dublin, are Cobh, Cork, Wexford, Crescent Quay and Galway Panorama, and Kenmare, Henry Street. There are about a dozen more still to come – and they really are coming, I promise. Loch Con Aortha is painted on canvas, 50cm x 20cm (20in x 8in), and is destined for America. A painting done largely on site on the Painting Tour in Cobh, and finished back in the studio in Dublin. This painting has had a long journey – literally since I started it in Cork and carried it on the bicycle all around the rest of Ireland to Dublin, and figuratively since, well I struggled with it after losing the momentum I had doing it when on tour – but I’m very happy with it now. This photo struggles with the contrasts a bit as well as some of the richness of the colours, but you get the gist. 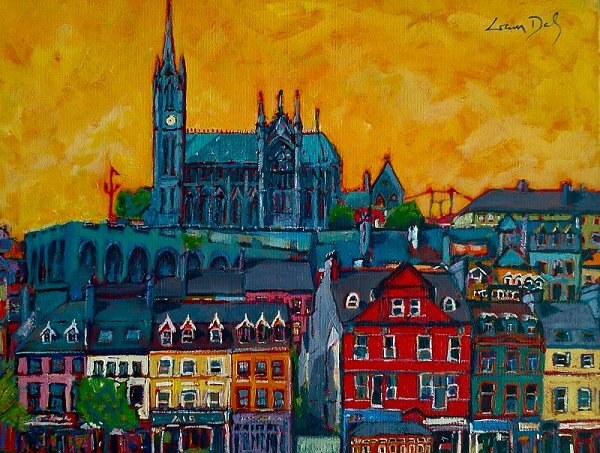 The experience of doing this painting also played a significant role in painting this other painting of Cobh I was recently commissioned to do. Other paintings mostly done on location on the tour itself and completed since back in Dublin, are Wexford, Crescent Quay and Galway Panorama, and Kenmare, Henry Street. There are over a dozen more still to come – and they’re coming, I promise. Cobh, Cork is painted on canvas, 40cm x 30cm (16 x 12 in), and is destined for New York. New painting. When I reached County Derry on the #PaintingTour, direct from painting the weir at Sion Mills and cycling from Tyrone, I got there there just before a hurricane called Katia. Too windy to cycle I waited for it to pass but it was also far too rainy to see much more than a few metres let alone the view that I wanted to paint. So I promised I’d return and do that painting. It was the only such promise I made on the trip and so last week I finally returned, waited for days for the rain to stop, stole glimpses from windows, cars, and memories, and walked in the rain and the clouds before putting this painting together. That’s Donegal in the distance over there to the left – Inishowen. On the Painting Tour I cycled down around the back of the church, and on across those flatlands of Magilligan and around Binevenagh Mountain, vomiting as I went for I was not well, to Coleraine and Portstewart before ultimately finishing that day in Portrush. The rest of the completed paintings from the trip can be seen here. I am currently very busy trying to get the last few finished, others sent out, and keep the rent going by doing new commissions. If you haven’t heard from me for a while it’s because I’m trying to spend the time getting the paintings finished rather than explaining why they’re not. Some paintings done mostly on site and finishing touches added in Dublin: Wexford, Crescent Quay and Galway Panorama, and Kenmare, Henry Street. There are over a dozen more still to come. The View from Loughermore Road is painted on canvas, 50cm x 40cm (20 in x 16 in), and is now residing on the Loughermore road with my wonderful Derry Painting Tour host. When I got to Phyllis & Mike’s B&B in Donegal town, the days were running out and I was chasing time. And while I might have managed to squeeze a painting out before cycling on to Tyrone, I instead very gratefully accepted a wonderful tour that included Killybegs, Slieve League, Glengesh pass, and Ardara. I have also added Sliabh League to the paintings page, while the painting itself has gone to Mike & Phyllis. Perhaps you’ll see it if you stay at the Lismolin B&B in Donegal town. 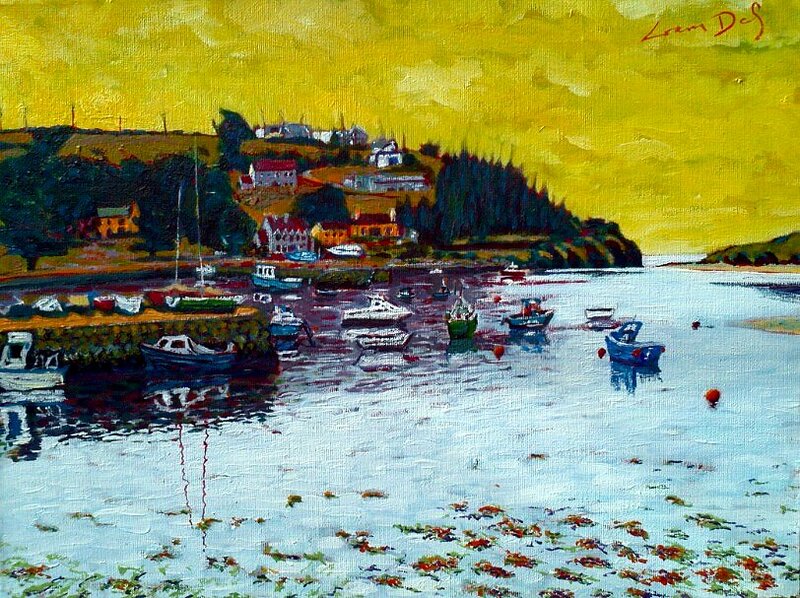 A painting I’ve kept from you since all but finishing it on site in west Cork, just south of Clonakilty in Ring. It was a wonderful day of painting in a stunning location, where residents, tourists, and boat-owners, came to talk to me and watch me paint – none more welcome than the woman who walked out of her house and across the road with a tray loaded with sandwiches, cakes, and tea, saving me the cycle into Clonakilty for what wouldn’t have tasted as nice anyway. And the reason I didn’t share this painting with you before now is because I wanted the woman it was commissioned for to see it first. It was a birthday present you see, a surprise. And a surprise for me was that I believed the very woman who silently brought me that wonderful tray was the woman who the painting was for – but you’ll have to wait for the book to get the full story. Finishing touches were applied to the painting recently before it was shipped ultimately to the birthday girl. Other paintings mostly done on location on the tour itself and completed since back in Dublin, are Wexford, Crescent Quay and Galway Panorama, and Kenmare, Henry Street. There are over a dozen more still to come. Ring, Cork is painted on canvas, 40cm x 30cm (16 x 12 in), and has returned to Cork. The tweets made while on the Painting Tour are being collated and presented now on one page. It includes tweets on the hashtag #paintingtour and other tweets that tell the story of the tour (where I forgot to use the hashtag or chose at the time not to swamp it with too much detail). As the tour lasted 85 days I’ve added an index at the top of the page so that you can jump to the tweets of a particular day. Where my tweets are a response to somebody else’s, I’ve included the text of theirs rather than provide an outgoing “in response to” link. All the photos referred to have been pulled in so as to save you clicking out to the relevant picplz, twitpic, yfrog, etc, link, though those links can also be followed. These are mostly photos taken with the phone or the tablet whilst the best photos were taken with the camera proper and not shared contemporaneously – a selection of these will be presented in their own gallery. For readability I plan to make more changes, mostly in styling, so that the core text can be more easily followed as a continuous story. It takes a lot of time though, so bear with me. A link to the painting tour story in tweets has been placed up on the main menu on the top navigation bar as “tweets”. Rather than paint when I got to Grannymar’s, we spent our time touring. So upon returning to Dublin I set about painting a scene from our travels. Slemish Mountain we stopped to look at on our way north to the Glens on our final morning. Slemish has been added to the paintings page. A new painting – finally finished – a commission from the painting tour. On Tuesday, July 26th, 2011 I left Glengariff in West Cork and cycled up over the Caha pass and down into Kenmare in Kerry. That evening I found my spot on Henry Street and painted until it was dark. The next morning I returned to my location outside Cupán Tae, where I was generously supplied with pots of tea as I painted amid visits by passers-by of all ages. It was a great day but despite the painting being almost finished I had to stop when I could leave it no longer if I was to cycle to my next destination before darkness (north of Beaufort via Moll’s Gap and Killarney). So this painting was then carried through another 20 counties, and taken out in all of them but I never managed to find the necessary strokes before it was back in Dublin where momentum was lost and life took over – until recently. 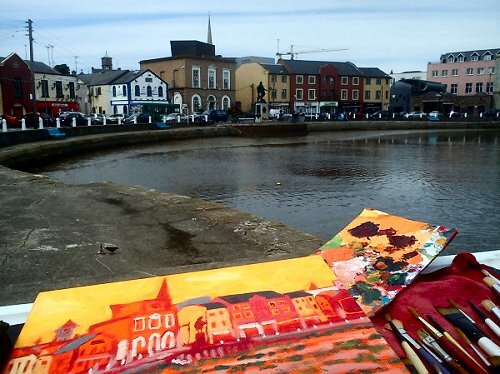 Other paintings mostly done on location on the tour itself and completed since back in Dublin, are Wexford, Crescent Quay and Galway Panorama. There are about 15 more to come. 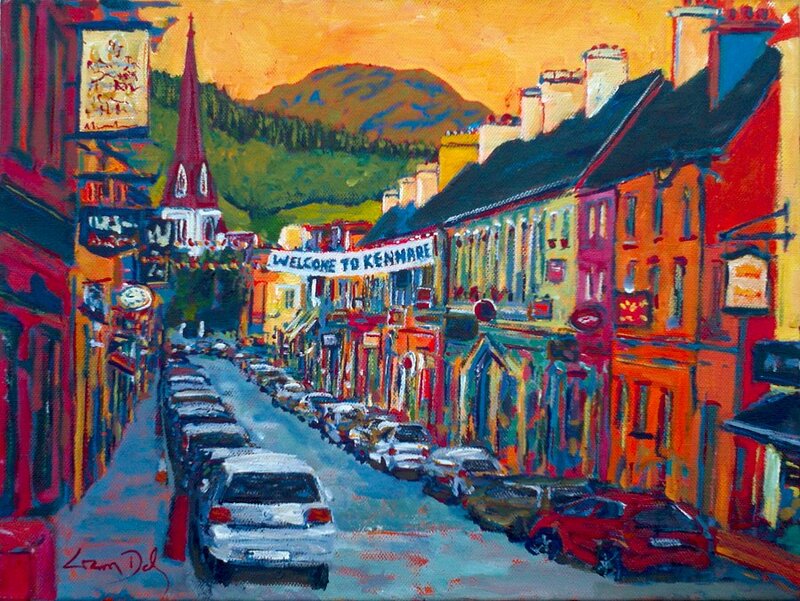 Kenmare, Henry Street is painted on canvas, 40cm x 30cm (16 x 12 in), and has returned to Kerry.